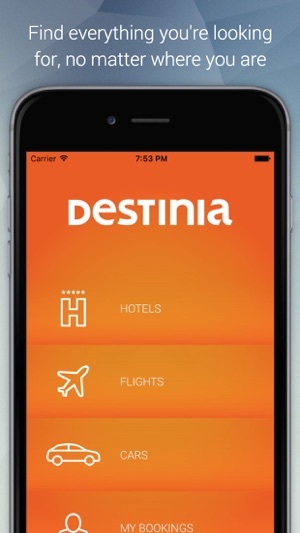 Destinia puts at your fingertips a selection of more than 500 airlines and 300,000 hotels around the world. A global offering where you will find inexpensive hotels to five star luxury establishments, always with the best prices available. Within hotels, you can filter your search by price, category or hotel name. You can even filter by TripAdvisor user evaluations. You can also select if you are looking for just accommodation, including breakfast, half board or all inclusive and can select the services you consider necessary for your stay. You can even search by city or proximity to a point of interest. Or if you prefer, you can look on the map to see which hotel best fits what you are looking for. Of course you can also order your selection. 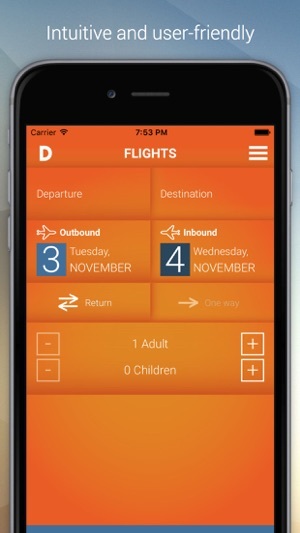 In flights, the app allows you to filter your search by schedule, trip duration, airline, airport or in function of if you prefer a direct flight or one with stops. The new version of the app includes a car rental search as well. Access a wide variety of rental cars. Find one that suits your preference and budget. Now we require less info: just your email, personal info for travellers, whether or not you would like insurance and the form of payment. The last step is to confirm the information provided. The Destinia reservation system provides an exceptional antifraud capacity, encrypting and protecting personal information to ensure the privacy of all of our clients. 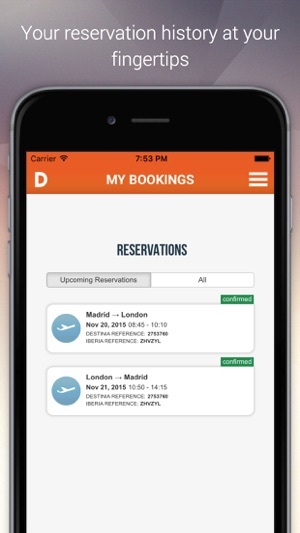 Register and you will have Access to a control panel to manage your upcoming reservations: check the status of each, contact your assigned personal manager and see documentation (tickets or vouchers) for all reservations made with Destinia (not just hotels and flights). Whether using your PC or Smartphone, the control panel allows you to view the status of your reservations and quickly access all the information you need. If you access the control panel within 48 hours of your reservation, you will see a more detailed version of the service. You can even check-in online for your upcoming flight. The application has an auto-complete function in the hotel search, which allows a faster search and you can search by hotel name. In addition, the app permanently displays our telephone contact icon, so you can call us at anytime. The app gives you a description of the hotel services offered, photos and a map to see where the hotel is located. You can also read the opinions of other users. The flight search engine detects the closest airport to you to use as the outbound location. And for hotels, the place where you currently are as the basis for the initial search. For every reservation made, a personal manager is assigned to provide personalized attention, who will send you an email with all the reservation details and documents. In addition, our customer service agents are available 24 hours a day, to always be there when you need us. Credit card payments are secure, given that all your data in each and every transaction is treated as confidential. We also accept payments made by PayPal, Bitcoins or bank transfer in certain cases. Are you planning a getaway, but can’t find anything interesting? Destinia has the solution! 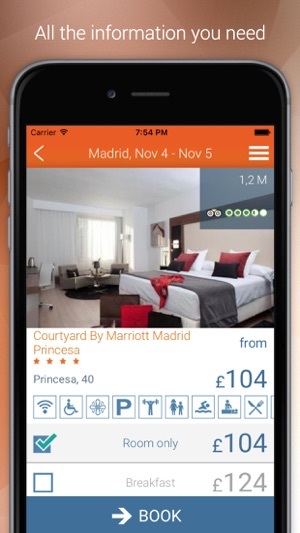 This new version of our app not only looks better, but also offers a better selection of hotels. 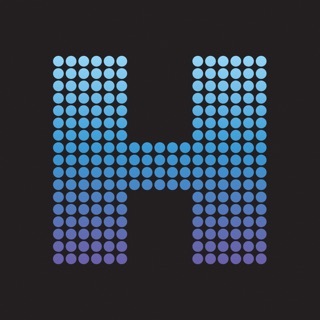 We have more hotels and lower prices than ever! So what are you waiting for? Make your reservations today!